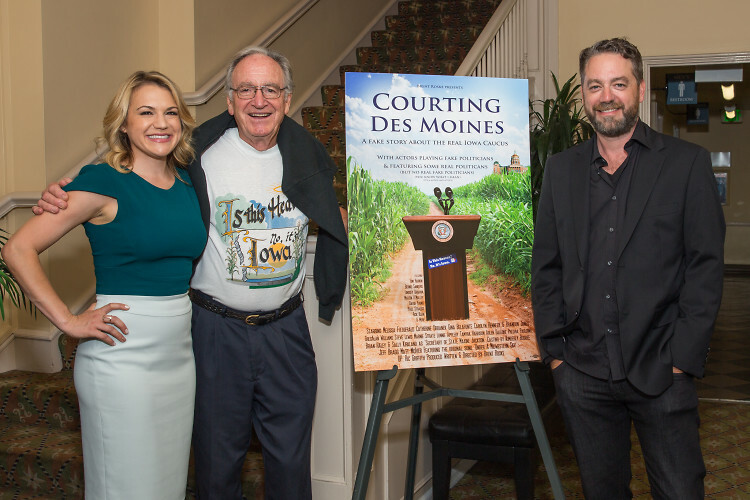 Former US Senator Tom Harkin hosted a screening of the new political feature film Courting Des Moines at the Chaplin Theatre at Raleigh Studios in Hollywood on Thursday, June 30th. “I’ve seen the film before and am excited to watch it again tonight. I think it really captures the essence of the Iowa caucuses and, truly, of Iowa as a whole. I think it’s a great film. They did a magnificent job, " said Senator Tom Harkin. Courting Des Moines is the fascinating sequel to the political drama Chasing The Hill (Emmy winner Richard Schiff, Emmy nominee Robin Weigert). While Chasing The Hill shows a California Congressional race, Courting Des Moines follows a disgraced former Congresswoman (played by Melissa Fitzgerald from The West Wing) and her ‘native Iowan’ campaign manager (played by Catherine Urbanek, Cooper Barrett) as they learn the ropes of running for President during the Iowa caucuses. Showing all the ins-and-outs of Iowa caucus strategy, Courting Des Moines is one of the best political films to come out this season. Cast members including Oscar nominee/Golden Globe winner Sally Kirkland were in attendance. “It was a joy playing a Secretary of State in such a timely film. Seeing it on the big screen last night – with all the political cameos in the movie like Bernie Sanders - was fantastic," said Kirkland. Other nationally known political cameos in the film include 2016 Presidential candidates Jeb Bush, Hillary Clinton, Lindsey Graham, Congressman David Young, Senator Paul Strauss, as well as former Governor of Pennsylvania, Ed Rendell, who plays the President in the film. A touching scene between Rendell and Fitzgerald stands as one of the many highlights of the production. “It was wonderful working on both Chasing The Hill and now Courting Des Moines – also especially meaningful to me to get to work with Governor Ed Rendell, who I believe is one of the greatest political minds of our time, who plays President Rendell. In the film, President Rendell is a dear family friend and mentor to the character I play, which mirrors our real life relationship.” The film was shot entirely in Des Moines, Iowa and includes many authentic ‘Iowa Caucus’ locations, including the Iowa State Capitol which hadn’t hosted a film shoot since 1973’s Norman Lear comedy Cold Turkey.